Gizmo is a crisp, articulate linear font from Dutch Icon that applies a machine-like precision to succinct forms with a human touch. Gizmo is suitable for work and play. It balances professional, technical, and user interface needs with fun icons for food, weather, and coffee among other areas. Its lines begin and end in unexpected, yet well considered ways resulting in a fresh, unique take on the established outline icon style archetype. Characterized by lively linework, Gizmo embodies the confidence and assertiveness of a finely crafted object. 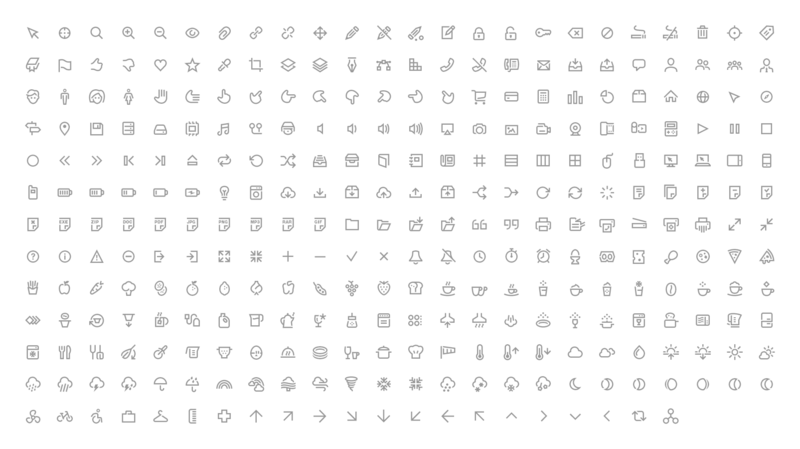 These glyphs display a high degree of consistency with proportions based on a 64px grid. Over 300 icons are contained in this set providing a wide range of choices that are warm, inviting, and easy to use.